Get to know Theodore Soluri, the Dallas Symphony Orchestra’s principal bassoonist since late 2015. Mr. Soluri pairs with cellist Jennifer Humphreys to play Mozart’s sonata for bassoon and cello on the program for the upcoming Bancroft Family Concert on Saturday, February 25. As always, the free concert begins at 3 p.m. at the Dallas Museum of Art. Doors to the Horchow Auditorium open at 2:30. Come early to guarantee seating! As a bassoonist, what do you love about chamber music? How is it different from playing in a large symphony? Playing chamber music is very different than orchestral work. The challenge of playing without a conductor is so rewarding and always makes a musician’s listening skills sharpen. It also gives us a chance to put more or our own ideas into the complete performance. Is chamber music for bassoon a big part of the repertoire? There is a fair amount of chamber music with bassoon, but certainly not as much as for strings, piano, and other wind instruments. As I primarily play orchestral music and opera, it’s always fun to get to play chamber music. How old were you when you started playing the bassoon? Why did you choose it? Did you learn other instruments? I started playing clarinet in seventh grade and took to it very quickly. I started eighth grade knowing that I would be first chair in the band. But when I showed up for the first day, my band director handed me a bassoon, a reed, and an etude book and told me I had two weeks to learn the basics before I was to start playing with the band. So for those two weeks I would sit in the instrument storage room during band rehearsals and learned all the fingerings I could and my C, F, and B-flat major scales. Then two weeks later I jumped right in. What type of music did you listen to as a kid? I was a child of the ’70s. The music in my house when I was growing up included The Rolling Stones, The Beatles, Frank Zappa, lots of folk music as well as some classical. I definitely had–and still have–a really varied taste in music that goes well beyond classical. You’re a relatively new transplant to Dallas. What has been the biggest surprise about Big D? Well, not surprising but definitely challenging has been learning my way around such a huge city. I’ve been in medium-sized cities for the past 22 years that were all easy to get around. Learning how to get to places and also learning alternate routes when the traffic is bad (which is more often than not!) has been interesting. I’m really enjoying Dallas, though. The people here are so nice, the food is great, and of course the orchestra is amazing. I’m honored to be here. It’s not unusual to hear of humorous stereotypes for certain musicians and their instruments in an orchestra. What’s a typical bassoonist like? Bassoonists are known to be very fun and laid back. Maybe that’s a reaction to playing one of the hardest instruments there is! But I also find it interesting that bassoonists also enjoy being in leadership positions, like orchestra committee chairs, delegates to musician conferences, and even personnel managers. Who’s your favorite composer to listen to? To play? This changes a lot but in general I love playing Mozart, Mahler, Strauss, Shostakovich, and Tchaikovsky. But my all-time favorite thing to play is a Mozart opera. Nothing cleanses my soul more than that! What’s your favorite sound (musical or non-musical)? Least favorite? My favorite sound is a purring cat. My least favorite sound is a screaming child on an airplane. Once you leave this world and reach the pearly gates, what celestial concert are you looking forward to? Wow, this is interesting! I would have to say the concert I would want to see is Tosca starring Maria Callas. What a true artist in every sense of the word. 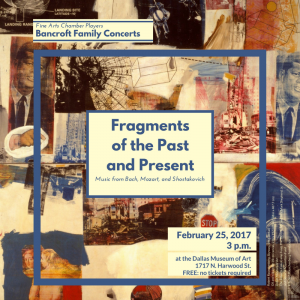 Join us for Fragments of the Past and Present, the next free Bancroft Family Concert on Saturday, February 25, 2017. This program explores the interconnectedness of music from the 18th, 19th, and 20th centuries. Held in the Horchow Auditorium at the Dallas Museum of Art (1717 N. Harwood Street, Dallas 75201), the program begins at 3 p.m. with doors opening at 2:30 p.m. The concert is FREE TO THE PUBLIC with no tickets required. The afternoon’s performers are: Nathan Olson, co-concertmaster of the Dallas Symphony Orchestra; Jennifer Humphreys, cello, DSO; Theodore Soluri, principal bassoon, DSO; Christopher Deane, principal percussion with the Las Colinas Symphony Orchestra; Douglas Howard, principal percussion and assistant principal timpani, DSO; Drew Lang, percussion, Dallas Wind Symphony; and Anastasia Markina, piano. The program includes Ms. Markina performing Johann Sebastian Bach’s Prelude and Fugue No. 1 in C major (the first prelude and fugue by Bach) and answering it with Dmitri Shostakovich’s Prelude and Fugue in D minor (his last prelude and fugue). Mr. Solari and Ms. Humphreys partner for Wolfgang Amadeus Mozart’s Sonata for bassoon and cello Kv292. The string players, percussionists, and pianist join onstage for a chamber arrangement of Shostakovich’s Symphony N. 15, op 141a, Movement I (Allegretto). Concert begins at 3 p.m., doors open at 2:30 p.m.
We are humbled to have received a 2017 Grace Note award from New Philharmonic Orchestra of Irving. This is the first time since the award’s inception in 2009 that the New Philharmonic has awarded a second Grace Note award to an honoree. The 2017 award is for our “leadership in bringing chamber music to the Dallas area” through our Bancroft Family Concert series and our annual Basically Beethoven Festival. 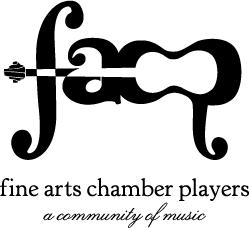 FACP was recognized with a Grace Note award in 2009 for helping build classical music audiences in the area. As the New Philharmonic explained, “these awards are presented each February to one or more groups who are doing something very special for music and music lovers in this area, adding a ‘grace note’ — an extra and much appreciated addition to the musical scene in north Texas.” Other honorees this year were Chamber Music International, Dallas Chamber Music Society, and Chamber Music Society of Fort Worth. Thank you, New Philharmonic Orchestra of Irving! We are so glad to have Linda Strummer as one of our Teaching Artists with FACP. A soprano, Ms. Strummer is in her fourth year teaching at Booker T. Washington High School for the Performing and Visual Arts. Before teaching, she enjoyed a career as an international opera singer for over 35 years (read more on her website, here). After studying at the University of Tulsa, she started working on a master’s degree at SMU, but left the program to launch her professional career. She has also taught as an adjunct and associate professor for 15 years at the University of Tulsa. How old were you when you started studying voice? I was 13. I also took piano lessons. Who is your favorite composer to sing? To teach? I can’t actually say I have one. I like almost all of them equally. I sweat bullets when I have to learn Strauss! But once I learn it, I love singing it. The same applies to teaching. I love helping a student learn a new piece and teaching them what I can about the style. What do you love about teaching high school voice students? I love being the first one to write in their “Singing Book,” metaphorically. I get the chance to help them build a good breathing foundation and formation of vowels and voice placement. Have you taught other ages? I won’t work with anyone who is under 14. So much changes during puberty – for guys and gals – that it can be dangerous. I have had many calls over the years from parents who want voice lessons for their 6 or 7-year-old. I tell them to have them learn to play the piano first. Then when they are 14 or 15 to call me back. What is a particularly memorable recital or performance of yours? A few years ago I did a recital of all Fauré music. I loved singing that one! And my debut (after being in Europe for 15 years) at New York City Opera under Beverly Sills with Sam Ramey holds a very special place. And, who could forget La Scala? So many memories. What piece of advice would you give 16-year-old Linda? Be more curious and don’t assume you know where you are going. An Oklahoma girl of Irish descent, CAN make a career in opera. Learn more! What’s your favorite sound (musical or non-musical)? Least favorite? My favorite would be a cat purring (especially mine). My least favorite would be an animal in pain. Once you leave this world and reach the pearly gates, what celestial concert are you looking forward to? I love Bach organ music! I’d love to hear that. Or just about any other composer playing his/her own music: Monteverdi, Schumann, Schubert, Fauré, Debussy. OMG, so many! I would also like to discuss with Puccini why, at the most crucial moments in his operas, he does not leave enough time to get the action done!